The City delivers 188 different services, many of them 24 hours a day, seven days a week. The cost to deliver these services in 2016 was $11.8 billion. A very significant portion of the City’s budget pressures are driven by its agencies – for example, the TTC and Toronto Community Housing. The costs for several of the City’s services are shared between the City and other levels of government. For example shelters, daycare, emergency medical services, public health and incomes support programs are funded by both the City and the Province of Ontario. It is important to recognize that the City performs a key role to deliver core businesses required by the Province. Demand for services is increasing and the cost to deliver these services is rising faster than inflation. Each year, the cost required to deliver the same level of day-to-day services to residents and businesses increases by hundreds of millions of dollars. Billions more are required to build planned infrastructure like housing, parks and transit. Overall City expenses have been constrained over the past six years, rising much more slowly than earlier periods. Spending per resident is slightly lower over the past six years, when adjusted for inflation, even with the addition of new services. Council has also annually approved new and enhanced service levels. 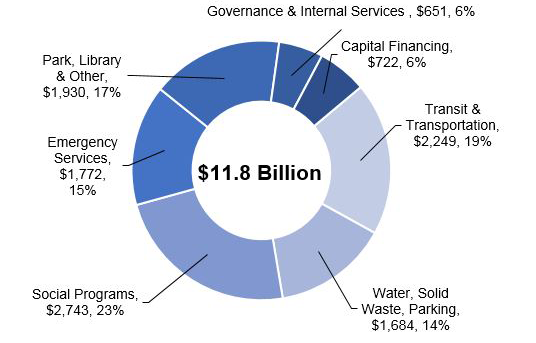 Expenses related to three broad service areas – transit, emergency services and rate-supported programs – account for almost three-quarters of the gross expenditure increase incurred by the City. Efficiencies achieved through line-by-line savings, program reviews, new technology and changes to collective agreements. Moderate savings from social programs which are cost-shared with the province. The savings from social programs may not be available in the future, reflecting Ontario’s assumption of increased responsibility for these programs. Deferrals of operating and capital expense – unfunded capital projects are now estimated at up to $29 billion over 15 years. The strategy of deferral is reaching practical limits as investment becomes necessary. Current expense management strategies alone have not been enough to maintain existing services and programs.